The best thing about autumn - trees that are green and nice throughout the year, suddenly burst into colour. I love this time of year where the hills are alive with the colours of autumn ;-) Everyday has new shades, there is so much change everyday, the air is fresh and crisp, the sky is amazingly blue - until one day it is all covered by a thick white blanket. To celebrate this special time of year, I made something special. 1-Preparation I sat down on our table (a table I used to sit already at when I was a child - a fact which is easily recognized when you have a close look, and that's what I love about it). 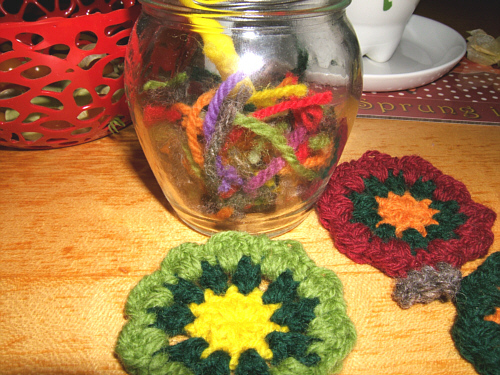 I had a cup of tea, some fresh fruit from the garden (a few cape gooseberries and a special very tiny and sweet type of tomatoes), gathered the wool I would need, arranged what I had already made and took my crochet hook. 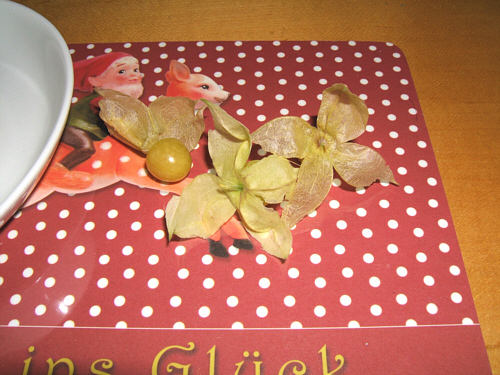 These special type of cape gooseberry (physalis pruinosa) was my favourite home grown fruit this summer. You usually get the first ripe fruit in June and can go out and pick some every day. I adore the way nature packed them and love to unwrap them before eating. 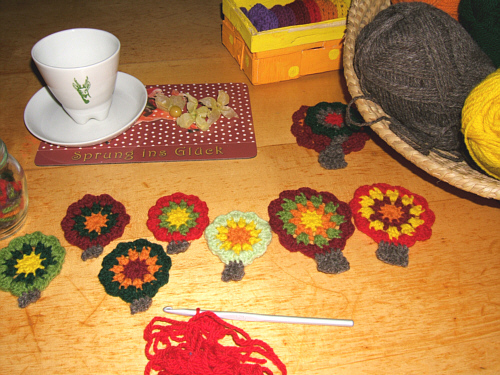 After an hour of tea, fruit and crochet, I had a nice little arrangement of trees in autumn colours. What to do with so many trees. I took a brown string, some small pegs and arranged everything into a basket. The next day: all the trees lined up into a autumn garland - and there are quite a few trees left to be sent away. 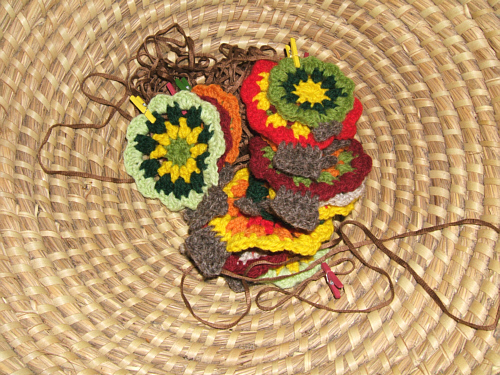 The november sheet of our MiaDeRoca calendar is featuring a picture of the crochet autumn tree garland. All that subscribe to our MiaDeRoca facebook page will get a crocheted autumn tree with every order (just mention that you are a MiaDeRoca-fan, when ordering) - this offer is valid until november 15th 2010. 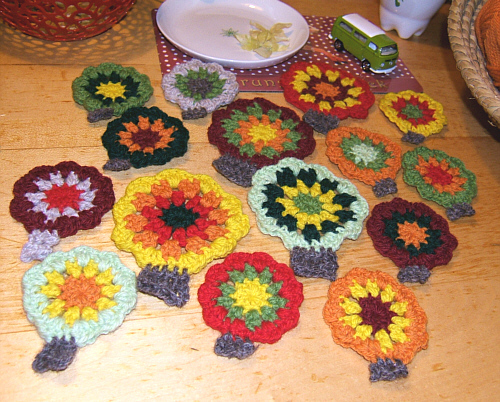 The pattern for the crochet garland will be available as one of the step-by-step e-books you can purchase at our shop. 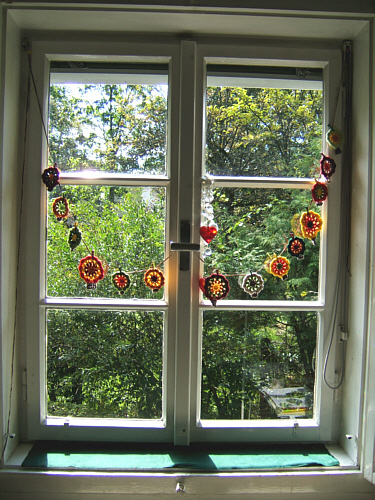 The cosy wool used to make the garland shown in the pictures is available in our webshop as well.